Today is Day 7 of the giftEDnz October blogging challenge and the theme for today is finding your tribe. The inspiration was this beautiful post. For me, finding your tribe is all about belonging and as a teacher it is my job (and privilege) to create an environment that engenders this. So I thought I would share some of the ways we work in Room 5 to build a learning community that embraces belonging. A couple of years ago I was at a Teachers Matter conference (please check here for information about the Jan 2019 conference) and I heard Adrian Rennie speaking about his classroom practice, I got a lot from his work including the use of a class chant. I created the chant below a couple of years ago for the class and it is handed down from one class to the next now... it is part of a Room 5 tradition. This poem/chant covers our expectations, or qualities of Room 5 learners (including myself), rather than use rules. We spend time unpacking what each of the expectations/qualities look like/sound like/feel like in action as a class when we start the new year. Each of us also add a feather to our class kakahu (cloak)- this is growing each year, so we are part of something bigger than just ourselves and our class this year, it is becoming a rather beautiful keepsake. This year we created inspiration boards that shared a little about our aspirations and loves. These were reduced on the copier and made into a framed entrance so people would know a little about us as they entered our classroom. The children took the originals home so they could remember these things at home too. This has been a much loved area of our classroom and attracts interest from all visitors. As part of this wall are QR codes with us sharing our pepeha- another way for us to get to know each other. We spend a lot of time exploring our brain, at the start of the year- how we learn, think, cope with big emotions. We have a calm down zone in our classroom. We have responsibility buddies (who change regularly) to help us with our learning tasks in the classroom. We explore strategies that help us to become better learners including what we can do to support the learning of others by finding out their learning preferences, and understanding a bit of how the brain works. This work is ongoing and becomes part of our learning language in the classroom. In the classroom I prefer to use inclusive language... we/us instead of I/me, our not mine or yours. This is deliberate. It helps to increase a sense of ownership and belonging. But this is only the tip of the iceberg... language is so powerful! This year I was lucky to have the opportunity to spend a day learning from Teacher Tom (http://teachertomsblog.blogspot.com/) who spoke at length about democratic processes in the classroom. I have always thought I was doing OK with that but I realised I have a long way to go to truly deliver my vision of a democratic classroom. He recommended exploring the work of Tom Drummond (https://tomdrummond.com/leading-and-caring-for-children/) and it is brilliant. There is so much to learn. The use of democratic processes truly engages students as citizens in a learning community... we all have a contribution to make and an expectation to work in ways that enhance our community of learning. This takes time, commitment and effort but it is well worth it I believe. There is a lot of choice in our classroom, that comes with its challenges of course but we are getting there. With the range of choice available there is scope for tamariki to work with a variety of others, including others from different classrooms at times. The combinations that I see pairing or grouping up sometimes surprises me which is a good thing, without being contrived these groups either succeed or fail on their own merits and the learning that comes from this I think is important for developing life skills. They also provide real opportunities for us to explore problems (and solutions) that happen when working and living and dealing with people... when being part of a group or tribe. At the end of each term we conduct a class audit, exploring what has worked and what hasn't, along with what we could improve or change to make our class even better. In the last term we used a PMI framework (plus, minus, interesting), the dialogue that went on as we explored this over a couple of days was great, and it was neat to see the extent of engagement and improvement in deep thinking about the topic from earlier in the year. We are stretching and growing and it is a privilege to be part of the learning community we are developing. 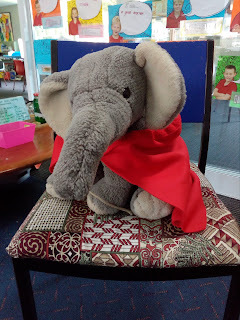 This is Einstein the elephant... our class mascot, and one of the greatest learners in the world! Thanks for Adrian Rennie for this idea too! Our classroom is full of quirky folk (me included), learning to embrace what makes us unique- our differences- our own brand of weirdness, and respect and enjoy the uniqueness of others is part of what we aim to achieve in our learning community. Again, we have some way to go but it is, as always, a mission worthy of pursuing.